Next Friday is Park(ing) Day, the international day of protest for open space and celebration of creativity. Every year, people from around the world set up small parks in metered parking spaces to make the point that as a society we allocate more space for public storage of people’s personal property and less for open space for everyone to use than we should. Santa Monica has a strong history supporting Park(ing) Day. 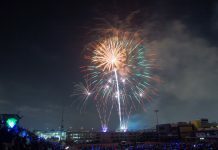 Santa Monica Spoke annually devises a multi-space park. Other groups, local gardening groups and neighborhood groups strive to one-up each other by transforming a lowly parking space into the most park-like atmosphere they can. This year, Park(ing) Day is Friday, September 19. So far, we only know of three spaces set for next week: a two-space “mega-park” in front of Swingers, hosted by Santa Monica Spoke, that will also have a Vote Local registration table; and a space on 26th Street. 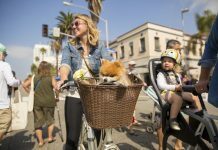 To help promote Park(ing) Day, Santa Monica Next will print a map with the local spots, promote the spots on our website, and, if there are enough spaces, schedule a lunch-hour bike tour of the spaces starting at Swingers. For us to plan, we’re going to need all the parkers to let us know when and where they’re Park(ing) Day Park is going to be. If you’re new to Park(ing) Day, make sure that you know your destination pretty well. It might seem obvious, but I’ve seen parks on fast moving streets that make good sense from a visibility standpoint but are wildly unpleasant (and unsafe) to spend any time in. 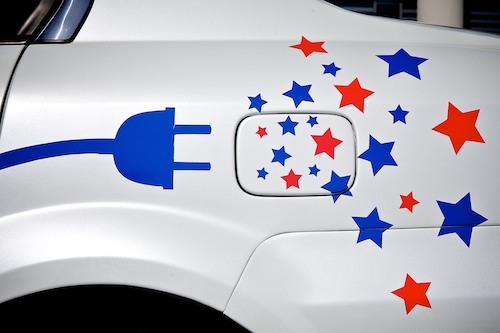 If you’re “parked” at a metered space, be sure to put quarters in the meter. Like any good political demonstration, there is a little bit of outlaw. In this case, any time you spend in a metered space outside of the posted limit, even if you feed the meter, is technically illegal. Park() at your own risk. Also, if you’re planning to grow your park in front of a retail store or restaurant, it might be a good idea to let the owners/management know ahead of time. Spaces don’t have to be elaborate or an all-day affair. 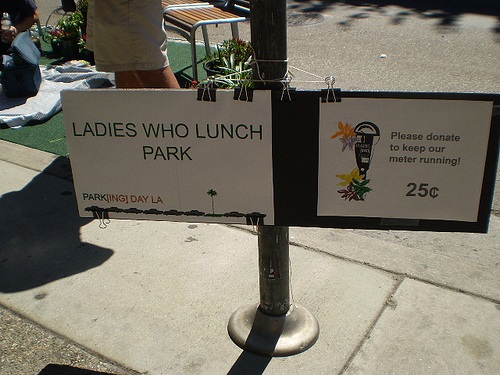 One of my favorite spots was “Ladies Who Lunch” in Los Angeles’ Little Tokyo District in 2009. It was literally two friends, some astroturf, two chairs, and a lunch date. Of course, if you don’t have the time or ability to put a park together, you can show your support by visiting one of the parks that are created. We’ll publish our map next week. 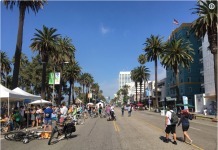 There is growing interest for Santa Monica to create a parklet program in some commercial areas in places such as Main Street in the Downtown. Park(ing) Day is a great chance to physically demonstrate that excitement. So get those creative juices flowing, and we’ll see you on the streets.